The city has many more World War I memorials than World War II memorials, and the reason why has a lot to do with Robert Moses. NEW YORK — Though World War I may not loom as large in American history as World War II, the city’s parks contain more memorials for the Great War by nearly two to one. And like many city planning decisions made in New York during the 20th century, the reason leads back to Robert Moses. More than 120 World War I monuments were constructed in New York City due in part to the massive mobilization that took place across the country in support of the fight and the fact that it was the first time in the country's history when a large number of men were called on to volunteer for a major foreign war, according to the Parks Department. Tributes to the war can be found all across the five boroughs, with some of the more notable ones including the Bronx Victory Memorial in Pelham Bay Park, the Zion Park War Memorial in Brownsville, and the Pleasant Plains Memorial in Staten Island. 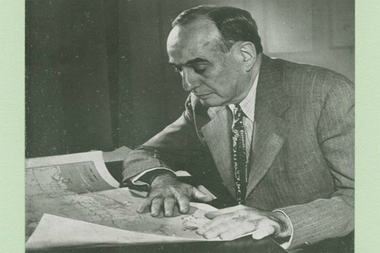 But Moses, who served as Parks Commissioner from 1934 to 1960, disliked several of these tributes, writing that the desire to honor World War I's fallen soldiers ultimately led to "hundreds of inadequate memorials, many of them poorly designed and constructed and often located where they were subject to vandalism and natural deterioration," according to a 1946 letter in the New York Public Library's Moses papers collection. He was determined to prevent the same problem from happening with World War II memorials. "We simply can't afford to have the parks and public places in the city filled with third-rate, inadequate, ugly and undignified neighborhood memorials," he wrote in an April 1944 letter to Brooklyn Borough President John Cashmore. So while city parks contain 122 memorials to World War I, they contain just 62 memorials to World War II, according to the Parks Department. Moses would have likely still considered this number to be too high, as he hoped to build only one World War II memorial per borough. "Anything less than the finest that the united efforts of the borough can produce would be unworthy of these men and women who made the supreme sacrifice," he wrote. He even indicates in his letter to Cashmore that his ultimate preference would be for just one citywide World War II memorial but found there was not enough enthusiasm for this idea. Moses shot down multiple requests to build memorials and rename city parks in his letters, including an attempt to change the name of St. Marks Square in Brooklyn to Colonel J. Gardiner Conroy Square and an attempt to name a small park in The Bronx at Jerome Avenue and 170th Street after fallen naval officer Rubin Keltch. "Long experience has indicated that the naming of park areas after individuals is almost always a mistake," Moses wrote in a July 1944 letter on Keltch. "It is usually a gesture to please a few people, has little meaning to the residents of the neighborhood, and is not the best way to honor the war dead." "The city already has lost many more men than there are parks," he continued, "and many will have to be slighted if the naming of park areas is the way the city intends to honor its dead." However, unlike many of Moses' other plans, the idea of one unified World War II memorial per borough never came to be except in Brooklyn, which dedicated its war memorial on Nov. 12, 1951, in Cadman Plaza, according to the Parks Department. The concept proved less successful elsewhere in the city. In The Bronx, for instance, Moses suggested that the borough's memorial be located at 149th Street and Grand Concourse, but Bronxites themselves had other ideas. "I have discussed this proposal with the veteran organizations and none of them seem to think much of this site," Bronx Borough President James Lyons wrote to Moses in 1945. "I am frank to say that I don't believe it would be the proper place." Moses' reply was simple: let me talk to them. "While I don't in the least discount your own eloquence," he wrote, "I think I could persuade the Veteran Organizations and leaders of The Bronx generally that the site suggested for the Bronx War Memorial is a good one."